Posture is more than just standing upright and looking confident and professional. 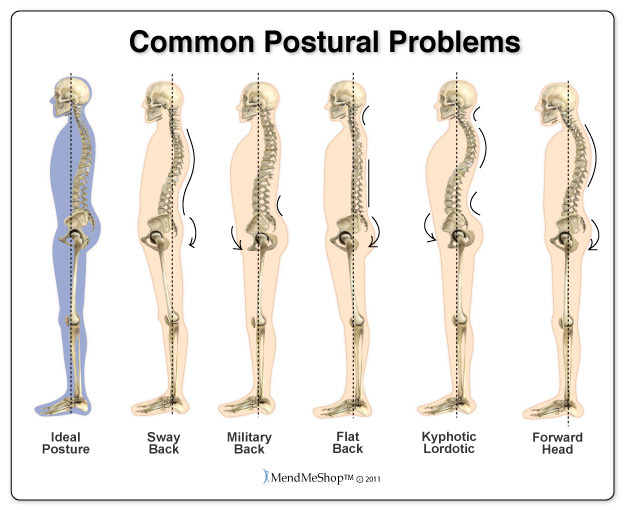 Posture is important for overall movement and function of the body. This is especially true when it comes to the spine, which is essentially the foundation of your body. In buildings and the body alike, if the foundation isn’t stable, the structure is likely to acquire damage and possibly break down over time. Postural abnormalities are alterations in the body’s foundation that cause unwanted physical stress in areas that are normally stress-free. These stressors can cause muscle spasms, muscle tightness, joint stiffness, painful movement, headaches, nerve pain, spine pain, tendonitis, and can leave you more susceptible to injuries over time. For example, if your ankle pronates (or turns in) on a regular basis, your knee often shifts to accommodate the ankle, which then causes the hip to accommodate the knee. Once the hip/pelvis shifts (even slightly) the spine may rotate and lean to keep the rest of your body upright, altering your overall posture. In this example, there is now abnormal stress in the ankle, the knee, the hip, and the spine. Over time, this stress can cause conditions like meniscal tears, patellar tendonitis, low back pain, muscle spasms, and more. Therefore, if this foundational issue is not corrected, the conditions associated with adapting to this postural abnormality can be a recurring problem. Our doctors assess your posture from head to toe and look for alterations that may be contributing to a current condition or have the potential to cause future pain over time. Whether minor like the ankle example above, or more severe as in the case of scoliosis, utilizing chiropractic adjustments and structural correction rehabilitation procedures in order to reduce the strain on the body and prevent future injuries is a great way to optimize your overall health.